There are many reasons that you might need to open a watch back and a variety of watch tools that can be used. If you need to change your watch battery or to replace a watch gasket, straighten the hands and remove dust, or completely replace a watch movement you will need to open the watch to do the work. 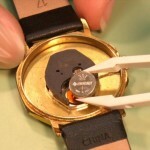 There are many types of watch backs that can be opened in a variety of mechanical ways that sometimes are very easy and can be done with very little effort and others that require a special watch back opener that are sometimes best done by a person with training or experience in watch repair. Before you open any watch, make yourself a mental note; Is this a very expensive watch? If the answer is yes, be very careful in attempting to open the back. 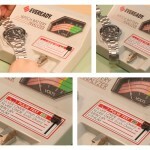 Even inexpensive watches can sometimes be very difficult to open and can be easily damaged. Always check if the band clasp will get in your way when you try to open the case: some metal bands make it difficult to work in the back because they are rigid and don’t leave much room for your hands to work. 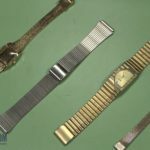 If you need to remove the watch band to access the watch case, check out this article on watch band replacement or watch band repair. 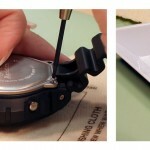 #1) A screw off “Waterproof” watch back will have notches for around the edges of the back of the watch. 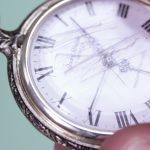 There are several different tools you can use to open a watch back like this, check out these articles and videos to find the style that works for you. #2) Pressure fit watch back or Snap Off watch back will have an entirely smooth back, and it should still be plain and smooth on the back when you’re finished. The second type of watch case back is the pressure type. 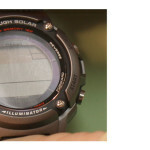 Many watches with this type have a small dent or notch on the side or between the lugs where you can place your knife. Sometimes this type of watch back can’t be closed with your hands and you will have to use a watch case press to close it. #3) 4 screws watch back will have a smooth back that is held in place with four, or more, screws. Watches like this can be made of any kind of material combination from metal cases to plastic or rubber cases to many more kinds of materials. These three types of watch case back are the most common, but there are many other types of watch cases as well and many of these should only be opened by professional watchmakers or jewelers. 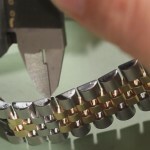 Rolex, Baum Mercier, and gold watches all require special tools and care when opening them and it is best if this work and care is left to professionals because they are easily damaged. The best thing to do when you encounter an expensive watch is to leave it to a watchmaker’s care, they have the tools and support needed to ensure your watch remains undamaged during repair. Another thing to watch out for is for watches that open from the front: if you look your watch over carefully and cannot see a way to open the back, you may have to remove the crystal to change the battery or complete your repair. We recommend that if you are at all unsure of removing a crystal, you should leave the work to a watchmaker. Most of all, we encourage you to keep an open mind and use a common sense before attempting to fix your watch on your own, if you don’t think you can do it, don’t be afraid of taking it to a professional. Can an automatic watch be safely opened if it’s movement does not hack?